Item #MS-178: On wood base with Lucite cover; From Brazil; 12.5x10x5.5" tall; White "wormy" Albite with 12 prominent and 100+ small Watermelon Tourmaline crystals. 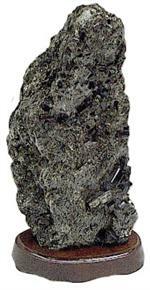 Item #MS-576: Lot of five Black Tourmaline crystals (Minas Gerais, Brazil) that exhibit the hexagonal crystal shape. 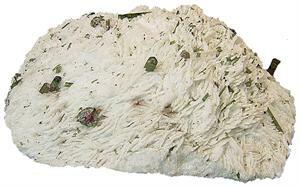 Our natural crystals are opaque with striations. Some have a termination point. Average height .5". 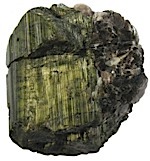 Item #MS-249: 8"x4"x11" Black Tourmaline (Brazil) with several crystals in gray/green schist on 1.5" wood base. 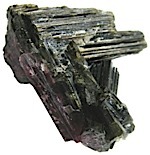 Item #MS-605: .5" to 1.5" tall, mostly dark to very dark Green Tourmaline single crystals. Some have Red Tourmaline cores; some have additional crystals of Albite Feldspar, platy Mica or Quartz attached. 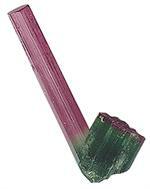 Item #MS-606: .5" to 1" tall, mostly dark to very dark Green Tourmaline single crystals. Some have Red Tourmaline cores; some have additional crystals of Albite Feldspar and platy Mica attached. Similar to group 1 but slighty smaller sizes. Item #MS-345: From Brazil; 1.5" long; Watermelon bowl; Pink pipe.